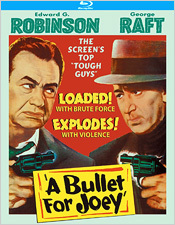 The 1955 film A Bullet for Joey sensationally promised excitement, with capital letters and exclamation points. “LOADED! With Brute Force… EXPLODES! With Violence,” proclaimed one poster. The crime drama paired “the screen’s top tough guys,” Edward G. Robinson and George Raft, for an uneasy blend of Cold War espionage drama with a police procedural and a tough gangster flick. Joey has recently arrived on Blu-ray from Kino Lorber, just in time for its 60th anniversary, as part of the Studio Classics line. Set in Montreal, Canada, A Bullet for Joey stars Raft as gangster Joe Victor and Robinson as his pursuer, Police Inspector Raoul Leduc in a plot involving nuclear secrets, spies, a blonde temptress (Audrey Totter), a book dealer who isn’t as he seems (Peter van Eyck), and a not-so-mad scientist (George Dolenz, father of Micky). Director Lewis Allen (Suddenly, Another Time, Another Place) manages to keep the plot from becoming too convoluted, but both his competent direction and the screenplay by Geoffrey Homes and A.I. Bezzerides fail to find a consistent tone or, indeed, much urgency. Joey is heavy on plot but light on real tension, with the pace remaining slow even when the stakes get higher and higher throughout the 85-minute running time. Chief among the film’s attractions is the pairing of Robinson and Raft, both of whom who had seen their greatest successes decades earlier. (Robinson’s career had also been impacted by the threat of the blacklist; a portrayal of his controversial activities during this period can currently be seen onscreen in the biopic Trumbo.) In 1955, both actors still had their rhythms down. Raft isn’t the most multi-dimensional actor in Joey, but he exudes the right air of menace. Robinson, too, appears committed to his good-guy role and is appropriately hard-boiled and cool. (He oddly disappears for too-long stretches.) Yet the climactic screen time with the two actors together is frustratingly limited. Joey comes to life most vividly when Audrey Totter is onscreen as femme fatale Joyce Geary. Appearing as if she stepped out of a noir, her presence heightens the drama. So does a turn of the plot involving Joe Victor’s crony Jack Allen (Bill Bryant) and young secretary Yvonne Temblay (Toni Gerry) which becomes one of the movie’s most chilling sequences. But other than a bar fight and a few cold-blooded murders in gangster film style, there’s little that’s truly pulse-pounding – or violently explosive, for that matter – in A Bullet for Joey. If the unusual A Bullet for Joey is more a curio than a classic, it nonetheless affords the opportunity to see George Raft and Edward G. Robinson sparring in a motion picture that’s far from typical. Kino Lorber’s Blu-ray might provide a diverting hour-and-a-half for aficionados unfamiliar with this period in both actors’ long careers.